For the past several months I have served on a committee preparing for an LGBTQ gathering that was held at the JA National Museum last Saturday. I have never worked with a group as committed. The committee was made up of 17 people from varied backgrounds, from a Christian minister to a worker at a Japanese restaurant. One of the program leaders was a recent graduate of a local university. I, and two others, brought in senior perspectives. Over $12,000 was raised for the gathering. Along with individual donors, also contributing were commercial companies, civil rights organizations and churches. “Okaeri” means “welcome home.” The word was chosen as the name of our gathering because it captures the sense of bringing together LGBTQ persons and all others in our community to consider the LGBTQ persons and their families who have been, so long, in need of understanding and respect. Co-chairs were two individuals who have contributed much to our community, Riku Matsuda and Marsha Aizumi. 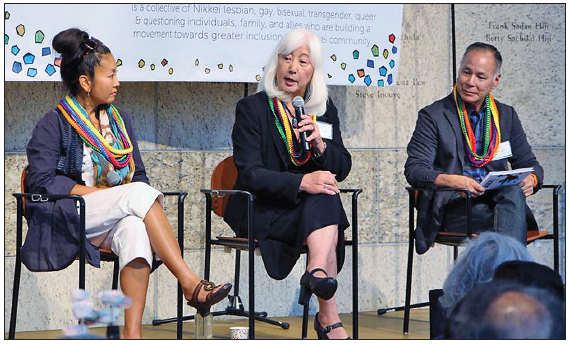 Marsha is the mother of Aiden, her transgender son, and author of “Two Spirits, One Body.” Riku and Marsha were recently honored by the Pacific Southwest District of the JACL at its annual awards luncheon for their contributions to the community. In addition, Marsha received the Nikkei of the Biennium Award from National JACL at its convention last July in San Jose. I am happy to report the gathering was a complete success on many levels. Over 200 were in attendance, including LGBTQ persons and their families from many parts of the state, as well as the U.S. Marsha, in an email before the gathering, said she was moved to tears by the email message of a mother who was coming from Hawaii and meeting her lesbian daughter, who was arriving from Chicago. The first workshop of Session 1, entitled “LGBTQ 101,” set out to provide an overview of the various identities comprising the capitalized titles. The second option during this session presented Rev. Jon Oda and Rinban William Briones, who made the case for religious advocacy for LGBTQ individuals. Rev. 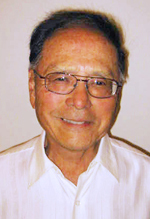 Mark Nakagawa served as facilitator. For the morning’s third option, Marsha and Aiden Aizumi related their family’s journey. Marsha’s husband, Tad, and their other son, Stefen, joined them in telling their story. For the fourth of the morning’s workshops, Traci Ishigo and others led a discussion with “progressive/radical” people to advance the cause of gender and sexuality liberation work. A delicious obento was provided for lunch by Maison Akira in Pasadena. Emceeing the lunch program was the lively Diane Ujiiye. Fourth-grader Maya Grace Kuida-Osumi read two original poems she had written for the occasion, and Rey Fukuda Salinas sang two original songs borne of his life experience. Okaeri panelists Marie Morohoshi, Mia Yamamoto and Gary Hayashi discuss their experiences. During this time the crowd was treated to an engaging panel consisting of Marie Morohoshi, Mia Yamamoto and Gary Hayashi. I appreciated Marie’s free-spirited telling of growing up in a traditional Japanese family (Nisei mother, Kibei father) as a lesbian. She spent her early years in Torrance and lives now in the S.F. Bay Area. Mia’s extensive and fascinating story as a transgendered female was well-received. I had heard Mia’s story before, but was again impressed with her willingness to continue to love her brother, who continues to be hostile to her transfemale identity. Gary’s story comes from a background of not being able to continue as a Christian minister due to his coming out as gay. He says because he was convinced homosexuality was a sin, he spent seven frustrating and unsuccessful years in a program called Exodus, in order to “cure” his gayness. He is now fully accepts himself as gay, and says he is glad to be able to share his experience with others. After lunch, one workshop in Session 2 was entitled “It’s a Genderful Life!” Transgender men, Riku and Rey, facilitated an exploration into gender identity and expression in and outside of the Nikkei community. Another Session 2 option was “Holding on to My Faith: A Culture Shift in the Christian Community.” Speakers were Rev. Dr. Ken Fong and Melvin Fujikawa, with facilitation by Diane Ujiiye and Bill Watanabe. The workshop focused on the changing attitudes in the Christian church towards those identified as LGBTQ, and evolving beliefs amongst Christians, both straight and gay. “Intersections: Between and Within” took the form of a facilitated group discussion on the intersections among the LGBTQ and Nikkei/ JA communities. Discussed were the lived experience of being LGBTQ and Nikkei/JA. Rounding out the workshops was “Coming Out: The Act and the Process.” The facilitators were Daniel Chu, Jack Yang and Sanjay Chhugani of API Equality LA. The workshop presented coming out as a process, beyond a single act. It was intended for those eager to learn how to “come out” as loving, supportive allies, friends or family. The interest groups in the afternoon put four groups of like interests together. Allies: A discussion concerning how allies can bring about change for the LGBTQ community by speaking out on their behalf. The final wrap-up session was facilitated by Diane, Bill and Traci Kato-Kiriyama. The planning committee is planning a well-deserved celebration dinner, and will be making plans for the future.